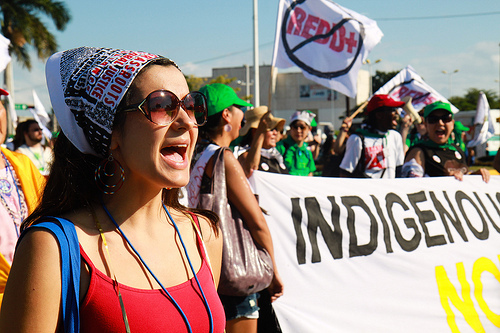 Cancún Betrayal: UNFCCC Unmasked as WTO of the Sky - Climate Justice Now!Climate Justice Now! We are not fooled by this diplomatic shell game. The Cancun Agreements have no substance. They are yet more hot air. Their only substance is to promote continued talks about climate mitigation strategies motivated by profit. Such strategies have already proved fruitless and have been shown to violate human and Indigenous rights. The agreements implictly promote carbon markets, offsets, unproven technologies, and land grabs—anything but a commitment to real emissions reductions. Indigenous Peoples from North to South cannot afford these unjust and false ‘solutions’, because climate change is killing our peoples, cultures and ecosystems. We need real commitments to reduce emissions at the source and to keep fossil fuels in the ground. Because we are on the front lines of the impacts of climate change, we came to COP-16 with an urgent call to address the root causes of the climate crisis, to demand respect for the Rights of Mother Earth, and to fundamentally redefine industrial society’s relationship with the planet. Instead, the Climate COP has shut the doors on our participation and that of other impacted communities, while welcoming business, industry, and speculators with open arms. The U.S., Industrialized nations, big business and unethical companies like Goldman Sachs will profit handsomely from these agreements while our people die. Women and youth in our communities are disproportionately burdened by climate impacts and rights violations. Real solutions would strengthen our collective rights and land rights while ensuring the protection of women, youth and vulnerable communities. While the Cancun Agreements do contain some language “noting” rights, it is exclusively in the context of market mechanisms, while failing to guarantee safeguards for the rights of peoples and communities. The failures of the UN talks in Copenhagen have been compounded in Cancun. From the opening day to the closing moments of the talks, our voices were censored, dissenting opinions silenced and dozens ejected from the conference grounds. The thousands who rallied outside to reject market mechanisms and demand recognition of human and Indigenous rights were ignored. Market-based approaches have failed to stop climate change. They are designed to commodify and profit from the last remaining elements of our Mother Earth and the air. Through its focus on market approaches like carbon trading, the UNFCCC has become the WTO of the Sky. We are deeply concerned that the Cancun Agreements betray both our future and the rights of peoples, women, youth, and vulnerable populations. While the preamble to the Cancun Agreements note a call for “studies on human rights and climate change,” this is in effect an empty reference, with no content and no standards, that will not protect the collective rights of peoples. The market mechanisms that implicitly dominate both the spirit and the letter of the Cancun Agreements will neither avert climate change nor guarantee human rights, much less the Rights of Mother Earth. Approaches based on carbon offsetting, like REDD, will permit polluters to continue poisoning land, water, air, and our bodies, while doing nothing to stop the climate crisis. Indeed, approaches based on the commodification of biodiversity, CO2, forests, water, and other sacred elements will only encourage the buying and selling of our human and environmental rights. There is another way forward: the Cochabamba People’s Agreement represents the vision of everyday people from all corners of the globe who are creating the solutions to climate change from the ground up, and calling for a global framework that respects human rights and the Rights of Mother Earth. If any hope emerges from Cancun, it comes from the dramatic demonstrations we saw in the streets and from the deep and powerful alliances that were built among indigenous and social movements. The Indigenous Environmental Network joined thousands of our brothers and sisters to demand real climate solutions based in the rights of Indigenous Peoples, the rights of Mother Earth, and a just transition away from fossil fuels. We will continue to stand with our allies to demand climate justice. The communities on the frontlines of the problem––those who face the daily impacts of the climate crisis––are also on the frontlines of the solutions. Community-based solutions can cool the planet! The fight for climate justice continues. We are committed to deepening our alliances with indigenous and social movements around the world as we build in our communities and mobilize toward COP-17 in Durban, South Africa. Social movements in South Africa mobilized the world to overthrow Apartheid and create powerful, transformative change. The same mass-based movement building is our only hope to overturn the climate apartheid we now face. We look forward to working with our African brothers and sisters and tribal communities in Durban. We only have one Mother Earth. As Indigenous Peoples, we will continue our struggle to defend all our Relations and future generations. The failures of the UN talks in Copenhagen have been compounded in Cancun. >From the opening day to the closing moments of the talks, our voices were censored, dissenting opinions silenced and dozens ejected from the conference grounds. The thousands who rallied outside to reject market mechanisms and demand recognition of human and Indigenous rights were ignored.